Final planning permission has been granted by Tower Hamlets Strategic Planning Committee to developer Canary Wharf Group to erect a 700,000sq ft, 27-storey commercial building. It will be located at 1 Bank Street in the east London docklands district. The building has been designed by Kohn Penderson Fox and will include three dedicated levels of trading space, a ground-floor retail unit, a retail kiosk on South Dock Promenade and basement car and bicycle parking. The South Dock Promenade will also have public access. 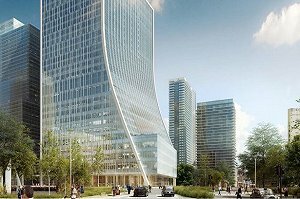 France’s Societe Generale has signed a contract to lease part of the building – eight floors from the ground floor to the seventh floor – in a 25-year lease from summer 2019. This will see the bank move its existing London operations from Tower Hill and Exchange Square to one location. Enabling works have already began, with construction due to commence later on this year.